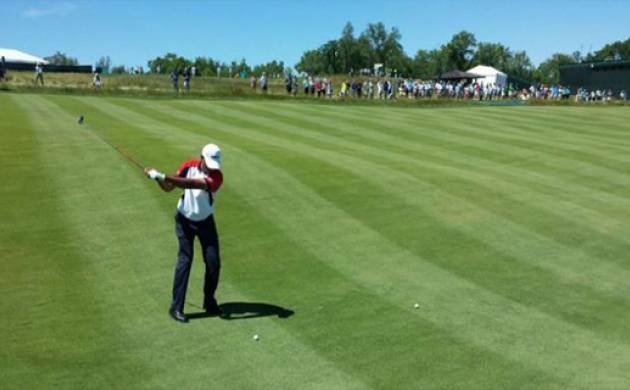 The Indian trio of Jeev Milkha Singh, SSP Chawrasia and Shiv Kapur crashed out of the Aberdeen Asset Management Scottish Open late on Friday. The 2012 winner, Jeev, who was tied 30th after the first day, had two double bogeys on his second nine, which was the front of the course, and carded 75 for a total of three-over 147 and missed the cut one shot. Chawrasia was unable to repair the first round damage of 78 and despite a one-under 71, he was five-over 149, while Kapur struggled to 78-76. Alex Noren took advantage of more benign conditions on day two to shoot a bogey-free round of 66 and open up a slender advantage heading into the weekend at Castle Stuart. The Swede posted six birdies in a flawless display in Inverness to climb to eight under par, one shot clear of New Zealand’s Danny Lee and Englishman Eddie Pepperell, who posted respective rounds of 66 and 67. World No 10 Branden Grace (six under par), Ireland’s Padraig Harrington and his fellow Major Champion Graeme McDowell (both five under) are also firmly in contention, whilst the home charge is led by Richie Ramsay (four under), Inverness-born Russell Knox and Marc Warren (both two under).